Paul McCartney Breaks $100 Million Threshold in Latin America, Sells 7.5 Million Tickets Globally. Beatles Radio: The Beatles, Solos, Covers, Birthdays, News The Fab 4 and More! 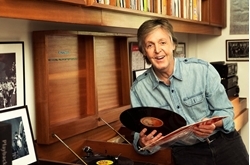 Sir Paul McCartney impacts the Hot Tours list dated April 6, 2019 with $17.8 million from four South American shows, according to figures reported to Billboard Boxscore. He returned to Buenos Aires at Campo Argentino de Polo on March 23 ($5.4 million), before heading to Sao Paolo’s Allianz Parque on March 26-27 ($8.7 million) and Estadio Major Antonio Couto Pererira in Curitiba, Brazil on March 30 ($3.7 million). With these recent grosses, McCartney’s solo career touring total in Latin America — as reported to Billboard Boxscore — grows to $101 million. Of that total, he has earned $21.5 million in Argentina (four shows) and $47.8 million in Brazil (10 shows). His recent shows at Allianz Parque are his first double-header in Brazil and as such, become his highest-grossing engagement in the country. These dates top this week’s Boxscore chart, only the second time he has done so in LatAm, following two shows at Mexico City’s Autodromo Hermanos Rodriguez on Nov. 25 and 27, 1993 ($6.5 million).